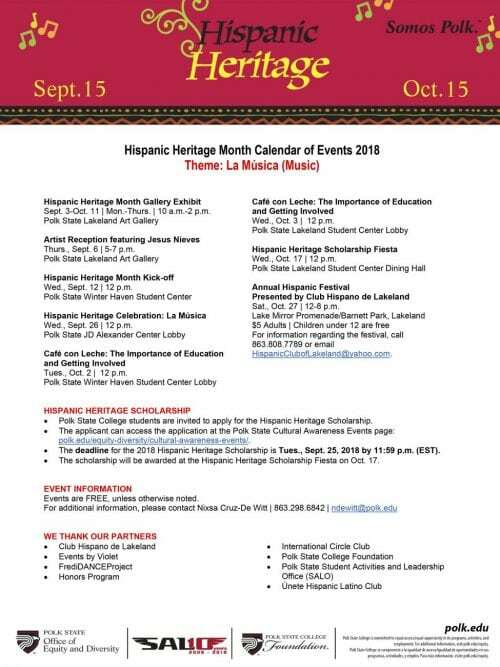 Join us for the Hispanic Heritage Scholarship Fiesta at 12 pm at Polk State Lakeland – Student Center Dining Hall. Come and learn more about Hispanic culture and enjoy music, food, and dancing. We invite you to apply for the Hispanic Heritage Scholarship. The application and criteria are available here. The deadline to apply is Tuesday, Sept. 25, 2018, by 11:59 pm. The scholarship will be awarded at the Fiesta. You will find the criteria and all related information on the application.